By now you've heard someone mention InstantPot. It's an appliance that I'm learning I simply cannot do without. Chicken is my go-to. By now you've heard someone mention InstantPot. It's an appliance that I'm learning I simply cannot do without. I think I learned this from my mother-in-law a long time ago. As a newlywed, I went shopping with her and watched her feed five growing and hungry boys on a budget most would say was nothing. Her staple was chicken -- that woman had a thousand recipes for the poultry and they were all good. My kiddos get bored easily if we simply grill the chicken. A few nights of barbecue and they're trying to find a friend who has an open spot at the dinner table. Since I received my InstantPot, chicken has suddenly become interesting. My life is full-speed. The schedules packed. I've taken the lazy way out, pulling into drive-thrus when I needed to crunch time. Then I realized that lazy way was far more work than an InstantPot. On a day when the accelerator was stuck in go, go, go! I resisted the urge. It was getting late and my husband pulled into the parking lot of some fast-food chain on our way home. I said, "Nah. I'll make dinner when we get home." He reminded me of the hour. That the kids needed showers, homework and then asked, "what are you thinking of making?" "Chicken with mushrooms, spinach, tomatoes and artichoke hearts." Perhaps it was the low sugar from the afternoon of errands, but he nearly lost his mind! "We need to eat before midnight!" he said in his voice signaling that if I didn't pull this off it would be Armageddon. We got home and in less than 30-minutes, I had a beautiful meal made for my family -- made of whole foods! InstantPot has now entered my kitchen and, people, I'm not turning back. It plugs into an electrical outlet for more regulated heat and the pre-programmed settings take the guessing out of how long to cook something. I'm inherently lazy and I'm feeding my family delicious, homecooked meals in less time than I can drive to the fast food joint, drive thru, order and get home with the food. 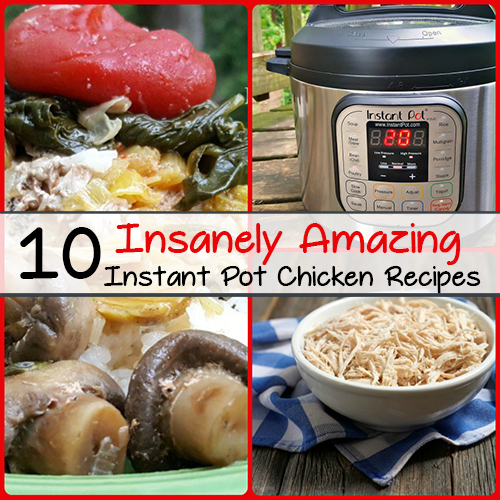 Here are 10 Insanely Amazing Instant Pot Chicken Recipes for You to Enjoy! If you have a stovetop pressure cooker, you can still use these recipes, but you'll have to adapt them and experiment with timing, as different brands cook at different speeds. Tip for converting recipes to slow cooker recipe: Use The Instant Pot "normal" setting. It's the same as "low" on most slow cookers.